After finding success with its Chromebook 11 in the education market, Dell is now chasing the enterprise segment with a premium Chromebook offering. Partnering with Google, Dell's Chromebook 13 comes with a beautiful design crafted from premium materials. The good news is that the price starts at a more affordable $399 (£255, AU$539) compared to Google's $999 (£799, AU$1,277) Chromebook Pixel. The design of the Chromebook 13 looks a lot like a mix of products from Dell's existing portfolio. The woven carbon fiber lid is borrowed from premium devices like Dell's XPS 13 and the Dell Latitude 12 7000 Series (E7250), while the wedge-shaped body and hinge is taken from Dell's consumer Inspiron 5000 and 700 Series. 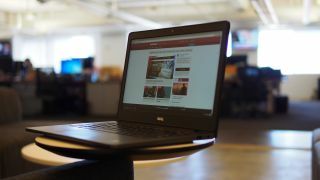 To keep the weight down to a light 3.23 pounds (1.47kg), Dell opted to use a magnesium alloy for the keyboard deck and palm rest and an aluminum cover for the undercarriage. Given that Dell is positioning its option as a more affordable alternative to Google's Pixel, the Chromebook 13 can be configured with plenty of power for performance seeking users. At the base $399 configuration, you'll find Intel's Fifth Generation Celeron processor clocked at 1.50GHz, 2GB DDR3 RAM, Intel HD Graphics and 13.3-inch anti-glare FHD display. At the most expensive $899 configuration, which is just $100 shy of what Google is asking for its Pixel, you'll get a dual-core Intel Core i5 processor clocked at 2.90GHz, 8GB DDR3 RAM, Intel HD Graphics and a 13.3-inch FHD touchscreen display protected by Gorilla Glass. There is also a Core i3 model of the Chromebook 13, and all configurations come with microSD reader, headphone and microphone combo jack, one USB 3.0, 1 USB 2.0 and an HDMI 1.4 port for video output.There are also dual-array microphones, a 720p HD webcam and stereo speakers for multimedia. All this power fits in a package measuring 12.93 x 9.03 x 0.66 inches (323.4 x 225.8 x 16.7mm). Even though the Pixel costs slightly more, you're getting more. There are more ports on the Pixel, and you get a more productive, but unorthodox, 3:2 aspect ratio display with a 2,560 x 1,700 resolution. To appeal to enterprise users, a full-sized backlit keyboard comes standard on the Dell Chromebook 13. The keyboard comes with Chrome shortcut keys. There is also a clickable glass touchpad. Dell is also bringing its experience in the enterprise market to the Chromebook 13 to help make adoption easy for IT managers. IT administrators can rely on Dell KACE for device management, and Dell SonicWALL helps users connect to corporate networks with a secure VPN. For strict enterprise environments, IT administrators can rely on Dell Content Filter subscriptions to create firewalls and URL filtering. And if you really need access to Windows applications, Dell offers a number of virtual desktop environments that will either enable you to run a full Windows OS in the background or to virtualize specific applications, like Microsoft Word or Excel. The Dell Chromebook 13 supports Citrix, VMWare and Dell Wyse desktop virtualization solutions. To help reduce downtime and provide enterprise-class service in case of failure, users can also add ProSupport Plus warranty plans to the Chromebook 13, which also covers accidental damage. The Chromebook 13 will be available starting September 17 in the US and Canada. Dell did not provide details about a broader international rollout.